The hand expresses what the heart already knows. 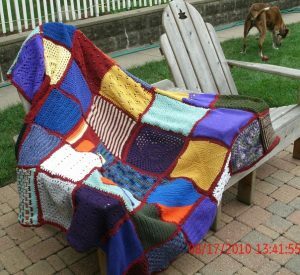 The afghan in the photograph was sold to someone in China. It is obviously handcrafted and I don’t remember how long it took to make but there was some time involved. The Adirondack seat it is on was also handcrafted. My brother-in-law made it and gave it to us Christmas 2009. It still sits in our backyard and I always look forward to the warmer weather. I photograph my products outdoors and as the photo of the hearts show, I use the chair to showcase more than afghans. 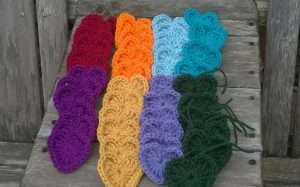 The knitted afghan, crocheted hearts and the woodwork of the chair, all show the power of our hands. We can create beauty from all kinds of resources. The pieces I make, either from my patterns or another designer’s combine fun, function and form. They’ll keep you warm and keep you cute. The feedback from my customers tells me they love well made items that they can gift to loved ones. That is what you will find here: quality items you are happy to give as a token of your care. Please be sure to read the blog. Something is always happening in Knitsville.